Dandruff is an embarrassing problem. It occurs when scalp becomes dry or greasy. 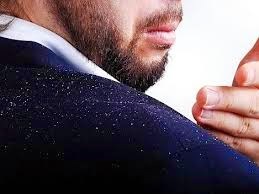 Dandruff can cause of Acne, Pimples, hair loss and premature graying. Some useful tips and home remedies are more effective for dandruff. Zinc is necessary for your hair health Vitamin E/fish oil (Omega-3s) improves the condition of your hair Use more fruits and vegetables. Massage your scalp one hour prior to the bath Drink at least 9-10 glasses of water or liquids daily. Do not too much oil your hair Do not share your towel and soap Daily wash your hair brush/comb Daily brush your hair, it improves blood circulation To get rid from dandruff easy wash daily and drain your hair. Use a branded dandruff shampoo. In this way you wash daily dirt and excess oils which causes dandruff. For regular best results, change your shampoo after every three months. Washing hair with buttermilk is the best natural oldest and tried tip to remove dandruff naturally. Wash your hair with butter milk once a week to cure dandruff. Mix 1 or 2 teaspoons of sesame seeds oil in yogurt and apply this mixture in your hair lines, 1/2 hour before having your bath. Wash your hair with lukewarm water. Mix coconut powder in yogurt and apply it 30 minutes before washing your hair. Mix few drops of lemon juice and 1 egg in Henna to make a paste. Apply it for 1 hour before washing your hair. The best tip to remove dandruff naturally. Mix 1 tablespoon of Mustard Oil in 8-10 tablespoons yogurt and one egg yolk. Apply it on your scalp for one hour for three days. After one hour rinse hair with normal water. It effects very quickly and nourish your hair. Take a Blue glass Bottle of 250ml and fill it with Tar Oil (50ml) and Mustard Oil (200ml) keep this bottle in sunlight for 3-4 hours about 30 days. After 30 days start to use this oil twice a week. Your hair comes thick, dandruff free, long and strong hair. Keep massaging with almond oil 2-3 times weekly. Almond Oil is a great dandruff healer. Mustard Oil with Egg Yolk for Dandruff Mix 1 tablespoon of Mustard Oil in two egg yolks. Apply it for 25-30 minutes then rinse. Repeat it once a week. Take 3 tablespoons of Chickpea Flour/Gram Flour, 6-7 tablespoons of Yogurt and 1 tablespoon Mustard Oil. Mix all thoroughly and make a past apply it with a brush in your hair and scalp skin. Leave it for 1-2 hours and then rinse with cold water. This is very effective natural tip for dandruff removal. Take a leaf of Aloe Vera and get the gel from inside it. Mix 1 tablespoon Hot Olive Oil in it and apply it on your scalp for 3-4 hrs and rinse with Luke warm water. It removes worst dandruff. Repeat it twice a week. Crushed Reetha (gooseberry) 125grms and fry in Coconut oil and Amla oil (125grm each). Fry the reetha in oil when oil turns into black color than off the stove. When oil becomes cold filter the oil. Massage with this oil daily to your scalp before going to sleep. Wash it next morning, within 3-4 days dandruff must go away. Your hair will become black and thick too by using this oil. Mix in yogurt 1 tbs Amla powder, 1tbs Reetha powder and 1 tbs Sika Kai powder and make a paste. Apply it on your scalp for 3-4 hrs. Very effective home remedy. Boiled eggs yolk oil massage is very much effective for dandruff and hair health. Tea Tree Oil for Dandruff Tea tree oil is very effective fungal oil. Massage it twice a week is very useful. It has stopped itching scalp. Mix 1 table spoon of Apple cider vinegar, 3 tbs of water and 1 tea spoon of lemon juice. Apply it with a cotton on your scalp skin, it is very effective for dandruff. Mix two Aspirin Powder in baby shampoo when you wash your hair, leave it on your scalp for 3-4 minutes. Than mix 2 tablespoons of mouthwash based on alcohol in your bath tub and rinse your hair with this water. After this again wash your hair with shampoo. Use it twice a week for dandruff. It really works. Mix 2-3 tablespoon of Ginger Juice in Mint Leaves Juice 1-2 tablespoon and apply it on your scalp it is also a very effective remedy for dandruff. Boil Neem Leaves in water in a large bowl, leave this water to cold and before shampoo your hair wash your hair with this Neem boiled water and then wash with shampoo. It is very effective for dandruff. Mix 1 tbs spoon of Vinegar in 4-5 tbs water and apply it with cotton to your scalp. Leave it overnight and wash your hair in the morning. Flakes removes and dandruff gone away. Thyme is very useful for dandruff treatment. Boil 4-5 thyme in Olive Oil or coconut Oil (125mg) for about 10 minutes and then strain it and let it cool down. Massage twice a week with this oil.